Baby is the size of: A pomegranate! At our ultrasound last week the tech confirmed that she was weighing in at 15.5 ounces - that's basically a full pound! She has started manufacturing meconium and she already has a lifetime's supply of eggs in her womb. Symptoms: I haven't mentioned this in a while, but I've been experiencing pregnancy acne since the day I found out I was pregnant. The breakouts are confined mainly to my chin, but I've never experienced breakouts like this before. I've been cleansing and moisturizing religiously, but it hasn't seemed to help. Does anyone have any recommendations of keeping these breakouts under control? Being pregnant, I'm fairly limited in the topical creams and cleansers that I can use. Movement: I'm still feeling her several times a day, but Steven has yet to feel her move. Some days she's a lot more active than other days. My doctor reassured me that this is completely normal and I shouldn't expect to feel consistent movement for a few more weeks. Last Thursday I was sitting on the couch watching tv when I felt her kicking. I reached my hand down to see if I could feel it from the outside, and she gave me the strongest kick right on top of my hand. It was amazing! Nursery: Thanks to my husband and father-in-law, the crib is up! We also have a glider and an armoire that my parents are giving us. The armoire was actually used in my nursery, which I think is pretty special. We still have a to put a fresh coat of paint on it (it's currently painted red), but once it's painted it will look perfect! You can see her nursery inspiration here. 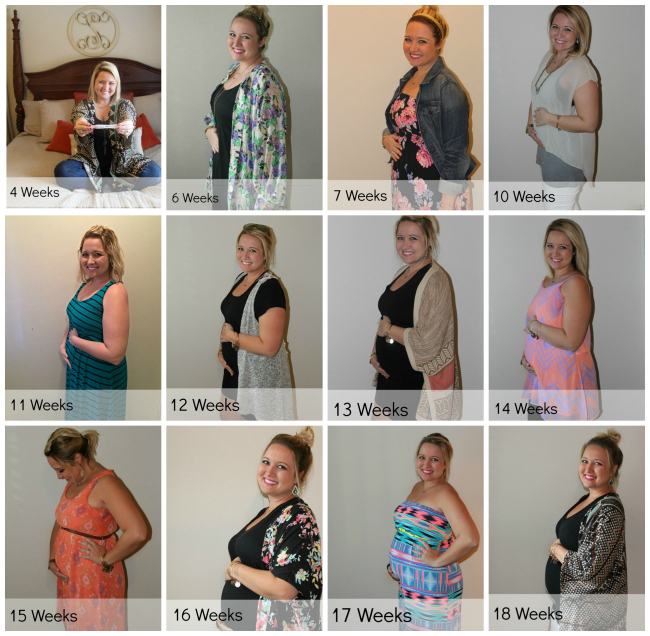 Maternity Clothes: It's pretty much all I'm wearing these days. Pink Blush Maternity and Target are my go-to stores for cute clothes at an incredibly reasonable price. Sleep: No complaints here! Some nights I find myself tossing and turning a lot, but I can usually fall back asleep pretty easily. Best moment this week: My parents closed on a brand new lake house on Friday, so Steven and I went down the lake on Sunday to help them get some things done around the house before my family comes in town today to spend the long holiday weekend with us. We love our little lake cabin that we've had for several years now, but the family has quickly outgrown the space! This house gives us much more room to spread out and enjoy. Another best moment was spending Saturday with Steven at Babies R' Us registering for our sweet girl. It was so fun to walk around the store and picture her using all the items that we were registering for. So exciting!! Missing anything: Nothing. I'm sure I will be missing cocktails with the family at the lake over the holiday, but it's nothing I can't live without! Cravings/Aversions: Here's a funny story: so last week we had a family dinner out to celebrate my brother's birthday. When it came time for dessert we all opted in (because hello, birthday celebrations!). For some reason the carrot cake just sounded incredibly delicious to me. I've never been a fan of carrot cake, but I really wanted a slice. I ended up ordering the cheesecake to split with my mom, but seconds later I made Steven find out server and change my order. That carrot cake was the most delicious thing ever!! It was so good I almost bought another slice at Publix over the weekend, but I restrained myself. Mood: So happy! I truly love being pregnant! Looking forward to: Spending the Fourth of July holiday with my family. I'm actually heading down to the lake today and my whole family will be there this evening. It's going to be such a fun long weekend! I can't wait! Husband is: Already wrapped around his baby girl's finger. I can't wait to watch their relationship grow! New mommy question: We registered for a pack n play over the weekend, but there were several different brands available. Does anyone have a specific brand or style that they would recommend over others? 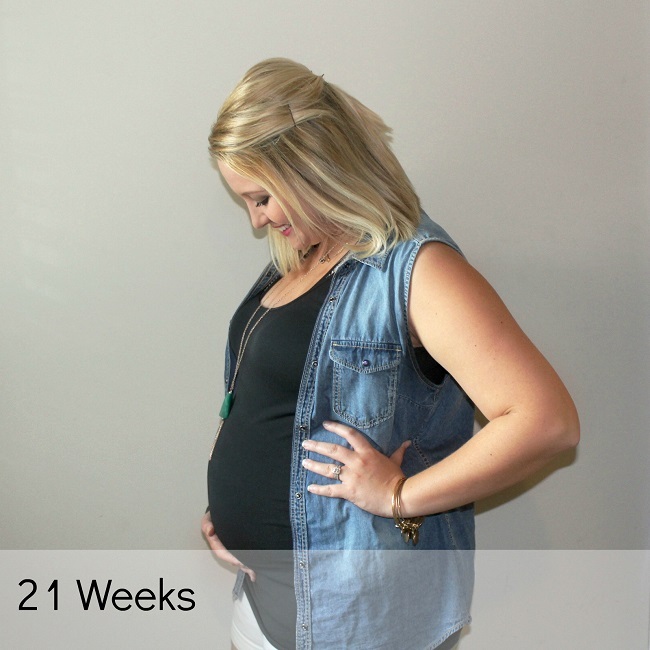 21 weeks!! You're getting there!!! Have a great time at the lake this weekend!! I'm feeling ya with the acne! This week has been terrible for my poor face! If you get any good recommendations or find anything that works please let me know! I feel like a 13 year old girl. :( that's so exciting about the lake house! Have the best time this weekend! So exciting! Registering is so fun! You are looking great. You look adorable!! Isn't registering SO much fun?! Overwhelming, yes, but also so fun. I'm glad that you are feeling so wonderful. I hope you have a great holiday weekend at the new lake house, how exciting! It much be so special to picture Charlie being there with you next year. I'm struggling with the pregnancy acne too mainly on my forehead and chin. I've never had a problem with my forehead. I quit using anything with salicylic acid and started using a Burt's Bee's face wash. It has done absolutely nothing to help. I found a face wash brand that caters to pregnant mommas called Mumsie that's only available at Walmart. I've got to order it because none of my stores have it in stock, but I'm really hoping it works!